Meeting Service At Polonia Airport With Our Representative Tour Guide, Leave Medan For Parapat - Lake Toba Tour, Lake Toba Is The Largest Lake In Indonesia And The Largest Volcanic Lake In The World. Approximately Five Hours Drive From Medan. Toba Lake Is The Largest Lake In South East Asia And Also One Of The Most Spectacular, Surrounded By Tall Mountains And With The Large Island Of Samosir In The Middle. If We Descend From The Mountain We See The Lake Glittering In All Its Beauty. 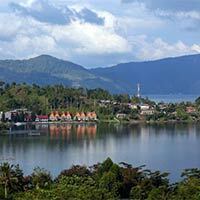 The Dutch Writer Rudy Kousbroek Even Called Toba Lake, 'The Most Beautiful Place On Earth'. Most Visitors Stay On The Peninsula Of Tuk Tuk On Samosir, Named After The Linguist Herman Neubronner Van Der Tuuk. In General People Stay Several Days On Samosir To Discover The Island, To Visit Traditional Batak Villages, To Swim In The Lake And Go To The Hot Springs In Pangururan. Enroute Pass Through Oil Palm, Cocoa, Rubber, Tea, Clove And Cinnamon Plantations, At Pematang Siantar . Enroute Visit The Kwan Im Temple (Quan Yin Temple (For Buddhist) Or Admire The Statue Of Kwan Im (Quan Yin) It Is The Biggest Avalokitesvara Bodhisattva Statue In Indonesia. This Statue Took 3 Years To Construct And Was Made Public On 15Th November 2005. For Buddhist, Kwan Im Is Regarded As The Goddess Of Mercy And Known As Bodhisattva Or Buddha-To-Be, Human Being That Is Almost Reaching Enlightment And Perfection. The Position Of Kwan Im In Siantar Is Called “the Sutra Holder Quan Yin” Out Of 33 Other Positions. Later Arrive To Parapat. Parapat Is A Small Town In North Sumatra Province On The Edge Of Lake Toba, On The Uluan Peninsula Where It Forms The Narrowest Eastern Link To Samosir Island. It Is The Primary Transit Point By Ferry For Visitors Going To Samosir Island, And Connected Via Trans-Sumatran Highway To Pematang Siantar By A 48 Km Road. Administratively It Is Part Of Simalungun Regency. On Arrival Check In At Hotel For Accommodation, Overnight Stay At Parapat. After Breakfast An Exciting Tour By Ferry Boat Cruising To Samosir Island Samosir Island, Is A Large Volcanic Island In Lake Toba, Located In The North Of The Island Of Sumatra In Indonesia. Administratively, Samosir Island Is Governed As Six Of The Nine Districts Within Samosir Regency. The Lake And Island Were Formed After The Eruption Of A Super Volcano Some 75,000 Years Ago. The Island Was Originally Connected To The Surrounding Caldera Wall By A Small Isthmus, Which Was Cut Through To Aid Navigation. At 630 Km², Samosir Is The Largest Island Within An Island, And The Fifth Largest Lake Island In The World. It Also Contains Two Smaller Lakes, Lake Sidihoni And Lake Aek Natonang. Across The Lake On The East From The Island Lies Uluan Peninsula. The Island Is Linked To The Mainland Of Sumatra On Its Western Part By A Narrow Land Connecting The Town Of Pangururan On Samosir And Tele On Mainland Sumatra. 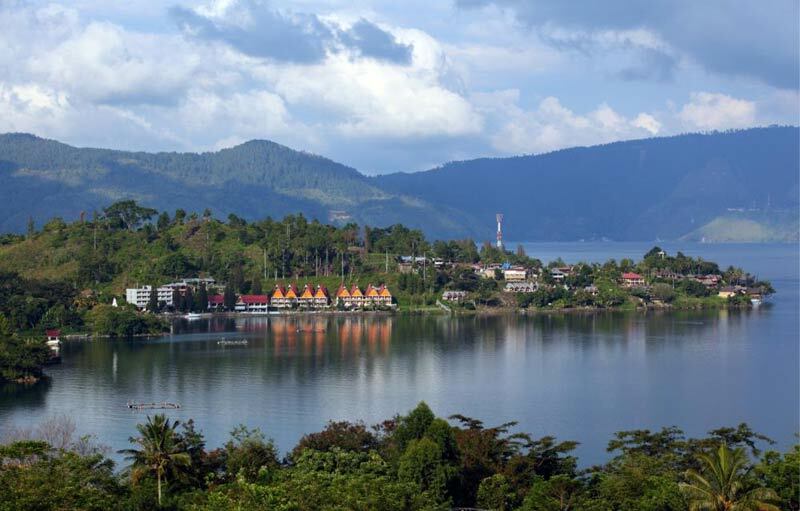 Tele Consequently Offers One Of The Best Views Of Lake Toba And Samosir Island Will Be Arranged, A Visit To Tomok Village Going Up From Simanindo Village And Going Along Lake Toba We Will Get To The Village Of Siallagan. In This Place There Is A Tourist Attraction Called The Village Of King Siallagan Which Is Surrounded By Stone Walls. Return To Parapat And Proceed To Medan Via Brastagi Berastagi (Meaning "Rice Store") Is A Town And Subdistrict Of Karo Regency Situated On Crossroads On The Main Route Linking The Karo Highlands Of Northern Sumatra To The Coastal City Of Medan. Situated At An Altitude Of 1300M, The Town Has A Cool Climate, Ranging Between 17 To 20 Degrees Centigrade, Making A Refreshing Break From The Heat Of The City. After Breakfast Leave Brastagi Downhill Towards Medan, Arrive In Medan Sightseeing Tour To Maimoon Palace, Istana Maimun Palace ( Maimun Palace Or Maimoon Palace) Is A Well-Known Landmark At Medan, The Capital City Of North Sumatra. Built By The Kesultanan Of Deli (Sultan Of Deli), Sultan Makmun Al Rasyid Perkasa Alamsyah In Years 1887-1891, The Palace Covers 2,772 M² And Has 30 Rooms. The Palace Has Become A Tourist Destination Not Solely Because Of Age But Also Because Of The Unique Interior Design Of The Palace, Mixing Elements Of Malay Cultural Heritage, Islam, Spanish, Indian, And Italian Style. Unfortunately, The Architect Is Unknown. Some Sources Say That It Was Designed By An Italian Architect While Others Believe That It Was Designed By A Dutch Captain Named Van Erp. Later Visit The Mariamman Temple Which Is The Biggest Hindu Shrine In Medan. It Was Founded In 1884 Ad. This Temple Was Constructed By Early Indian Settlers In Medan Brought By The British To The Island Of Sumatra. The Temple Depicts Various Gods And Goddesses Adored On The Columns, Walls And Ceilings Of The Temple Depicting The Great Culture And Tradition Of Hinduism. You Will Be Welcomed By Caretakers Of The Temple. Visit The Local Shopping Centre After Lunch Proceed To Airport For Departure To Next Destination.